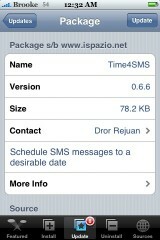 I am totally stoked with the update to version o.6.6 of Time4SMS!! There are no visual changes to the application and no new features however…it works!! I was able to set-up a text and it actually sent at the time I scheduled it for!! I love it! I was optimistic when I set up the text, closed the application, reopened it and the text was still displayed on the list. In the previous version, when you reopened the application the list would be blank even after you had scheduled a text. After that, I had a feeling it was going to work this time and it did! YAY! 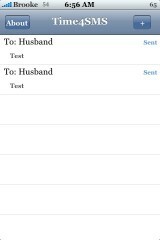 It even sent a scheduled text while my iPhone was in “sleep” mode, which I wasn’t sure it would do. So, try it out and let me know in the comments how it is working of you…it seems to be working just fine for me. I am sooo going to use this all the time! Doug better watch out! Also, this application has been moved to the iSpazio source. This program doesn’t work very well. It screws up your calling. Try to initiate a call .. the speaker is silent ! It works only as long as i leave the app open. When the phone is in sleepmode, the sms isnt sending at all. Could it be possible,that if i’d install an app like insomnia,which lets an app access wifi in sleepmode,it would work?? Still ain’t working in “sleep” mode. ok, i lefta message for myself using this app to send in 20 minutes. then i quitted this app, and put my phone in sleep mode (screen blank). after waiting for 21 minutes… got the message sent… i think it works in sleep mode? same here Whatthe. does not work in Sleep mode. How did you got it to work in sleep mode Brooke? My text was sent only when I woke the phone up. Huh….I didn’t do anything special. I just scheduled they text and then locked my iPhone and left it. Doug got the text at the time I had scheduled it for. It’s working in sleep mode for me after the update! There is a 4 minute lag time from the time I set it to send but I can live with that. 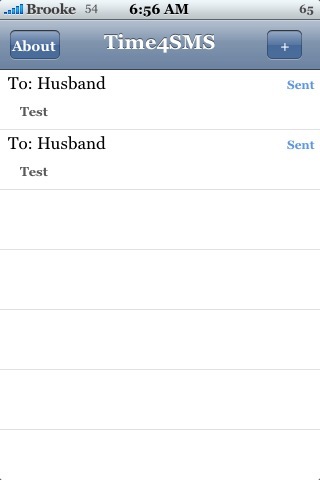 I have created a new future SMS to be sent, but then I have decided that I want to delete it…. now how do I do that ???? I spoke too soon, tried again and this time… nothing. 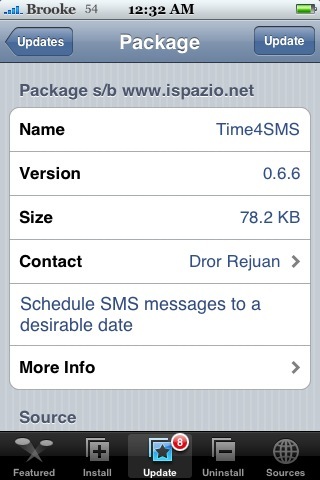 It’s been 22 minutes since the scheduled SMS and it hasn’t worked yet… bummer! What about insomnia??? Would it change anything in sleepmode? ?